I have everything working! I’m going to do just a few more tests this weekend, then I should be able to get back to digitizing, processing and posting. I also now have access to a professional-level noise reduction and de-popping program so my finished products should be better than before. I think I mentioned in a previous post that I’m going to start with some really bad recordings. Not only will that spare my new stylus (I’ll record those with the old one), but it will be a good test for the noise reduction program. I’ll try to find something extra-special for my first upload. I finally got my new computer last week–hooray! I got Cubase installed yesterday (ridiculous the hoops they make you jump through to register and activate a free program) but I’m having problems getting signal from my turntable to it. The same thing happened when I tried to record using my husband’s work laptop, and sometimes happened with my old computer. We never were able to get it to work on my husband’s, and the fixes I used on my old computer aren’t working now. On the bright side, I’m on summer vacation from homeschooling my kids so I should have a little more time to devote to figuring it out. Thanks to all of you who are still following me. Please continue to be patient as I get these bugs worked out! Update: Bad news. 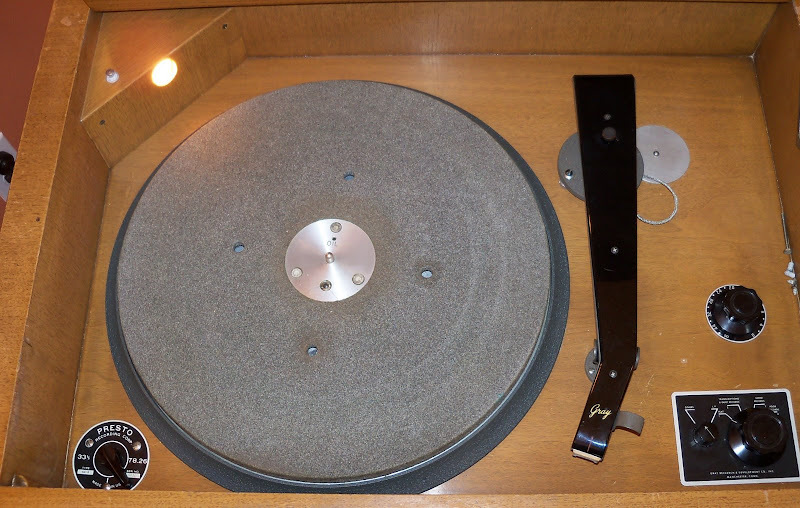 It looks like the problem is either my phono preamp (which isn’t a big deal to replace) or the connection from the tonearm to the preamp, or something within the tonearm’s wiring. I’m hoping it’s just a loose connection somewhere. I’ll keep you posted. I just can’t catch a break lately. A couple of weeks ago, my laptop died. That computer is the only thing I have for digitizing, editing and posting my recordings. Fortunately, my husband was able to repair it. Unfortunately, the repair didn’t stick. Last night it died again–just as I was nearly finished with the editing of the next recording I was planning to post. To make matters worse, we’re away from home right now so we don’t have the tools he used last time at our disposal. Hopefully he’ll be able to get it up and running again within a few days. But if he can’t find somewhere local to borrow the tool he needs (a heat gun) then the repairs will have to wait until we get home in about two weeks. I have a really great recording to put up next, too. It’s a “House of Squibb” program from the day after D-Day, all really great patriotic tunes. So please bear with me! Hopefully one of these days I’ll be able to stop making excuses. Sigh. Welcome to the all-new Grandpa’s iPod! I know I haven’t really been around long enough to reinvent myself, but I wasn’t happy with Tumblr from the start. I’ve been using WordPress for so many years that I just couldn’t get used to something different. Please resubscribe to the RSS feed here. You can click the link in the address bar or the gray RSS icon to the right of the search box. The podcast feeds have not changed, so if you’re already subscribed you don’t need to do anything. I couldn’t figure out a way to get your comments on the old site transferred over here, which I’m a little sad about. But I’ll go back through them and make sure that I’ve edited anything really important directly into the relevant post. Now that the migration is done I can get back to the records. I transferred quite a few last weekend after I got the turntable fixed. I should be able to get some quick editing done tomorrow and have a new audio file up by the end of the day. I haven’t posted much in the last few weeks, and it wasn’t only because of the holidays. I’ve said that the music I post here would be the playlist on my Grandpa’s iPod; well, I also have what would have been the “iPod” itself: a 1946 Presto 64-A studio transcription turntable. It’s the only thing I have for playing the records. About a month ago, it stopped working. I was devastated. We thought maybe the motor for the 33.3 drive had burned out and removed the whole motor/transmission assembly. I found a reasonably local guy who thought he could help me, so I took the whole thing up to him. He was able to tell with a quick look that the motor seemed to be fine, and informed me that it was probably the capacitor. That was a relief. It took quite a lot of searching, but we finally found a capacitor that was close enough to the original specs (no one makes any exactly like what’s in there now). My sweet husband sat down to take out the old one and solder the new one in and discovered that the connection to the old capacitor was broken. A quick solder job and a test connection with the turntable proved that that had been the problem all along. Hooray! But. When we took the motor assembly out, we found that the motor mounts had completely fallen apart. 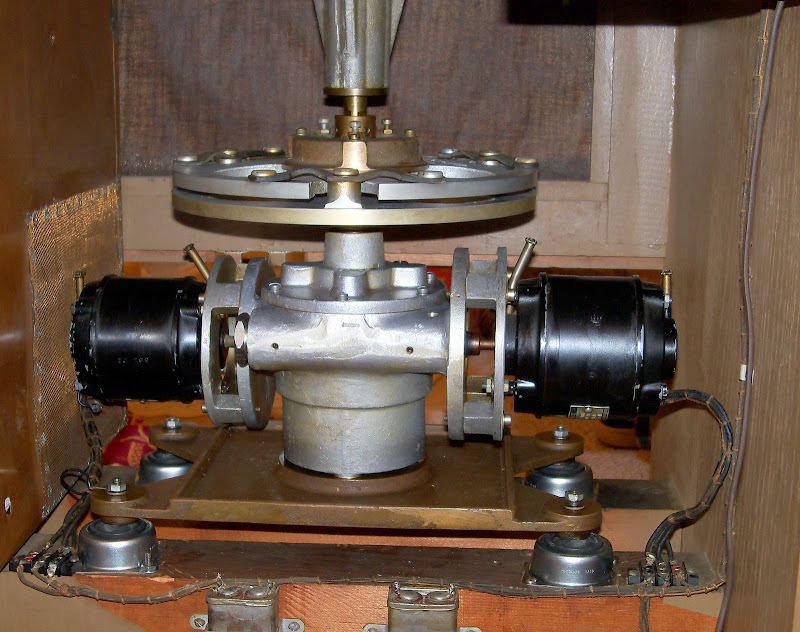 Everything in this turntable is set up to isolate vibration; there is no direct connection between the motor and the cabinet or the motor and the turntable. The mounts have a rubber isolator set in a metal case. 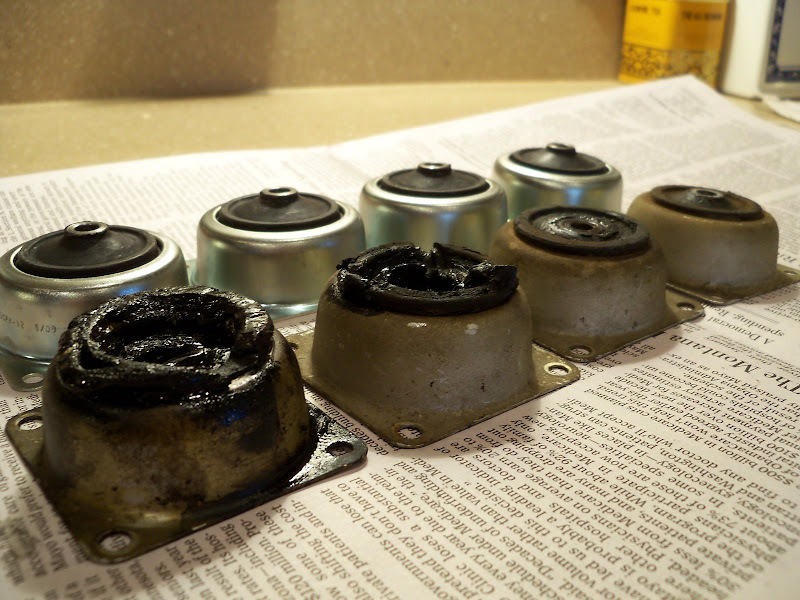 63 years of oil dripping on the rubber had made two of the four mounts completely disintegrate. Again, a lot of research was needed to find replacements. There is no “close enough” on these; they have to be exactly the right dimension (especially height) or the whole turntable won’t go together. We finally found a tiny marking on one of the original mounts that gave the name of the manufacturer: Lord Mfg, Erie PA. It turns out that Lord Mfg. is still in business and now supplies the aerospace and other high-tech industries. A customer service representative was extremely helpful on the phone, and found a current part that matches the old one exactly! The replacement mounts arrived yesterday. We’re installing them this afternoon, then I should be back in business. I’m planning to do a lot of recording in the next couple of days, so by the end of the week I should be able to get back in the swing of editing and posting. On a side note, I know some people have been having problems with this site. I’m not sure what the issue is, but I’m working on a new site that will be hosted elsewhere. For now, make sure that any bookmarks here point to www.grandpasipod.com (not the tumblr address). That will both continue to bring you here while this site is active and will take you to the new site once I make the change. I’ll keep you posted as I get closer to making that change. My audio files will still be hosted at grandpasipod.bandcamp.com, and the podcast will also stay the same. Here are pictures of what we went through over the last month. Grungy and dead. Time to pull it out. Okay, it’s out; now what? All back together, clean and with new mounts! The podcast will include just the audio file and basic information—for all the juicy details you’ll still need to come here. Audio streaming will still be available here at the blog, courtesy of my bandcamp site. High-quality downloads will also still be available that way. If there’s anything else I can do to make my material more accessible please let me know and I’ll do my best to accommodate. Thanks for your patience! Posted in Housekeeping | Comments Off on Podcast now available! Well, I’m realizing I was being a bit overly ambitious when I said I’d try to post new audio every day. Recording and editing is taking longer than I thought it would. Life also gets in the way: Christmas, kids, yadda yadda. So I’m readjusting my expectations. I’m still planning to put up new audio several times a week—my goal is going to be around three files posted per week. I just got a new noise reduction plug-in and am in the process of figuring it out: Voxengo Redunoise. It seems like it’s going to make a big difference in the audio quality of my posts, so I think I’m going to wait a few days and see if I can get it figured out. If it seems like it’s going to take me longer than that I’ll go ahead and put another file or two up, but I’d like to wait and try to improve the sound of what I’m doing. Speaking of Christmas, I’m going to try to get some Christmas music up soon. I don’t think I have any complete shows of holiday music, but my grandpa made some recordings for his own use that have some good stuff on them. Some you’ve heard before (White Christmas, anyone?) but some you might not have (how about a version of Jingle Bells done with each chorus in a different language?). I know some readers have had issues with Bandcamp, the site that’s hosting my audio files. They have informed me that they’re working on getting the Flash programming removed from their download flow and hope to have that resolved in the next couple of weeks. I want to wait and see how that goes before giving up on them. I like the fact that they provide both streaming and downloads in such a variety of formats, and it keeps things simple for me. I’m also still working on getting a podcast going. Just keep watching (and listening to) this space! Posted in Housekeeping | Comments Off on Improvements are coming!